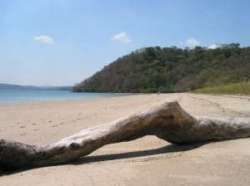 The Gulf of Papagayo is located in the beautiful Guanacaste province in Costa Rica, close to the Liberia International Airport and the border to Nicaragua. Papagayo and the surrounding areas have only just recently been developed for tourism, and you will find new hotels and exclusive five star and all inclusive resorts. They are all near the coast and the Santa Rosa, Guanacaste and Rincon de la Vieja National Parks. Twelve beaches extend along the Gulf of Papagayo which are known for its sandy beaches, clean water and its beautiful surroundings. And it is just a short drive away from Hermosa, Ocotal and Flamingo, a region experiencing tremendous economic growth. The proximity of the Daniel Oduber International Airport in Liberia is a big advantage and makes arriving from Canada or the US very easy. The Gulf of Papagayo is most famous for its warm clean beaches where visitors can enjoy the scuba diving, snorkeling, surfing and sport fishing. Costa Rica's government has dedicated to preserve the environment while allowing tourism developments. Travelers can also visit the Rincon de la Vieja National Park with the amazing and active Volcano Rincon de la Vieja which is surrounded by hot springs, blue lakes and beautiful scenery. Its surrounding forest is very popular for bird watchers. And then there is the large Santa Rosa National Park where you will find an abundance of beauty in the form of plants, wildlife and beaches. Santa Rosa is also of historic importance to Costa Rica. It was in 1856 when the Costarricans fought William Walker, the American filibuster which tried to invade the Central American countries, in order to enslave the nations.